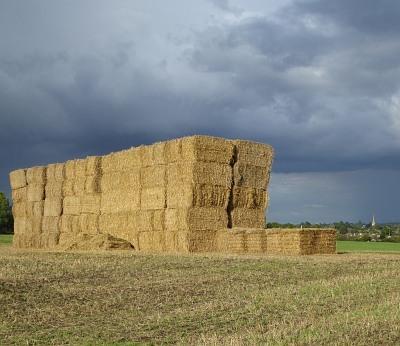 These bales of hay, stacked near the Tythe Farm estate in Abingdon, could be seen earlier in the month with the spire of St Helen’s Church in the distance. Harvest Festivals are not as traditional looking as they used to be. Canned fruit – not this year’s harvest of apples and pears – are more practical. 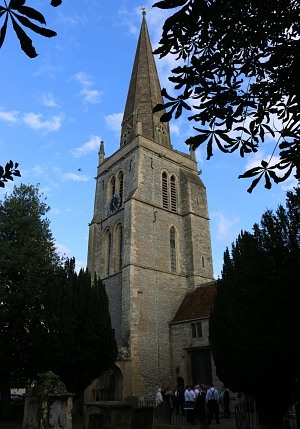 Last Sunday, St Helen’s Church, had their Harvest Festival. 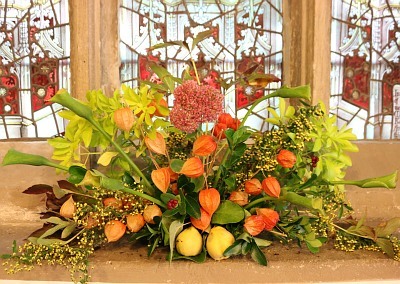 There were autumnal decorations round the church windows. 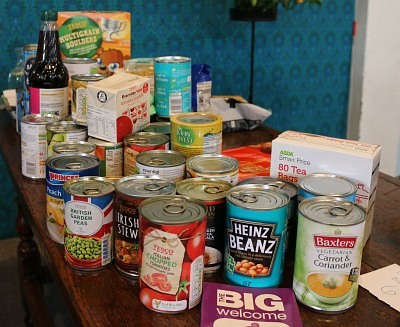 People also brought the harvest from local shops to be donated to the Abingdon Food Bank. 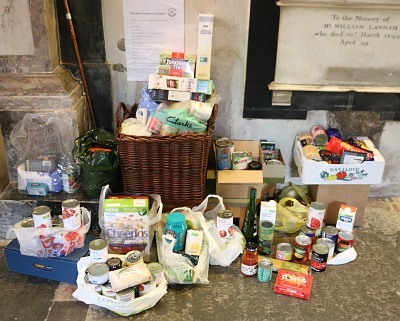 Abingdon Baptist church also had a Harvest service, with goods donated to the Abingdon Food Bank. At Trinity, where I am a member, the Harvest will be this coming Sunday. Donations will go to the Asylum Welcome Food Cupboard in Oxford. 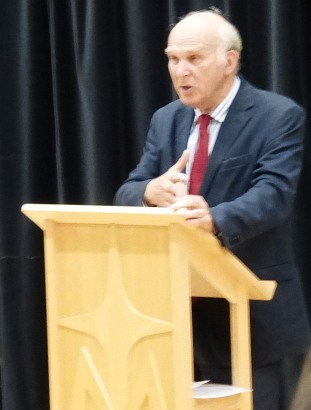 Vince Cable was at Our Lady’s Abingdon, as part of the school’s annual Reading Festival, to talk about his new book. He said that the last five years in government, as Business Secretary, has been some of the most challenging he had ever experienced. Reading novels during those times helped keep him sane, and he was a great advocate of reading, and bookshops. Vince came to talk about his new book “After the Storm”, a major update on his earlier book “The Storm”. He said that sometimes one had to resort to metaphors to explain complicated matters, and a better metaphor for the storm that engulfed us all in 2008, with the near banking collapse, might have been “Heart Attack”. In 2015 the patient is still on life support, with historically low interest rates, and nobody dares take it off. 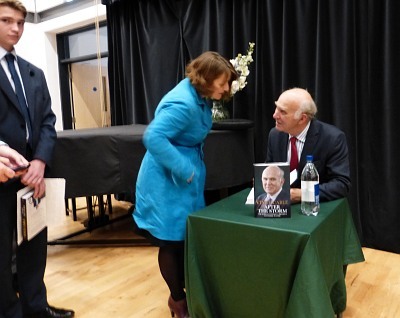 After talking through the key points in his book, he took questions, and explained economics in a way we could all understand – a very absorbing and interesting evening. 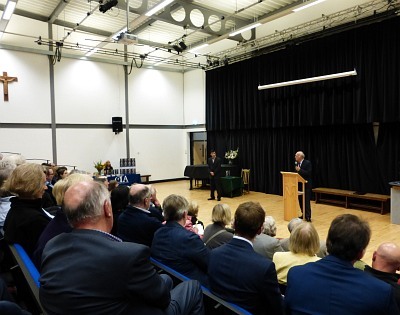 The Principal of Our Lady’s, Mr Stephen Oliver, introduced the evening and thanked Vince Cable at the end. Mark from Mostly Books fielded questions, and Nikki from Mostly Books was on hand with a wonderful display of “After the Storm” books that people could buy and have signed afterwards. 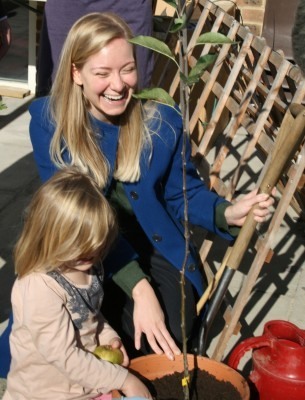 Nicola Blackwood, local MP, is pictured here at South Abingdon Children’s Centre, in happier times. Oxfordshire County Council are soon to consult on the closure of most of the 44 Children’s Centres in Oxfordshire to save £8 million annually, cutting by half the amount they spend on children and family services. 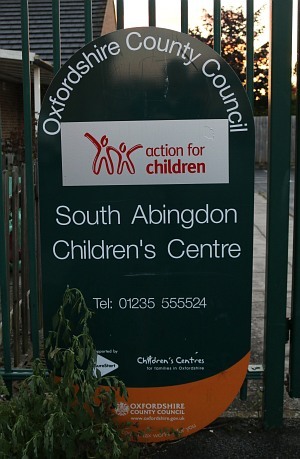 They will probably look to move all Abingdon area services to the early intervention hub on Stratton Way, and relabel it as a Family and Children Centre. Children’s Centres have made a difference to parents as well as children, with parenting courses, and local support for families. They are highly regarded for aiding child development pre-school. They are a safe place to get help from the excellent staff who are known locally. I would have thought that given there has been a dramatic increase in Child Protection issues in Oxfordshire, now is not the time to cut the budget by half. 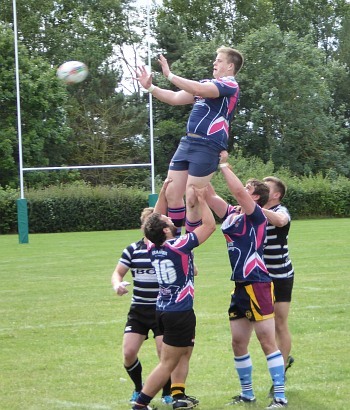 A few weeks ago Abingdon Rugby Union FC held their annual Sevens Tournament. I went along and took some pictures, but did not have time to post them here. Rugby Sevens is the equivalent of five a side soccer. 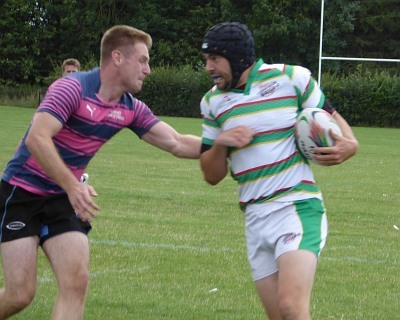 The game is far more open and far more tries are scored. 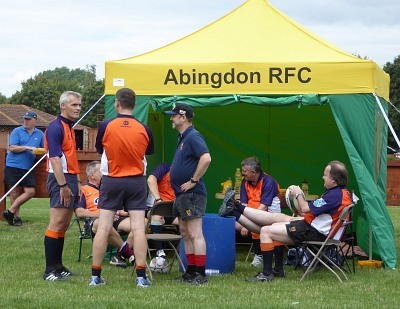 It was the 60th time the Rugby 7s tournament had been held by Abingdon RUFC. It is a pre-season event before the full teams take to the field. Now the Rugby World Cup has come to these shores and there are are 2 or 3 exciting games, with 15 players on each side, to watch every day at the Kings Head and Bell, and other local pubs. This afternoon, David Thomas, was ringing with 5 other Abingdon bellringers to celebrate David’s birthday. They rang a peal lasting 3 hours and 5 minutes with 5040 changes (pulls of the rope). The peal ended at about 5:10pm. David was born at 5:08pm 18 years earlier. 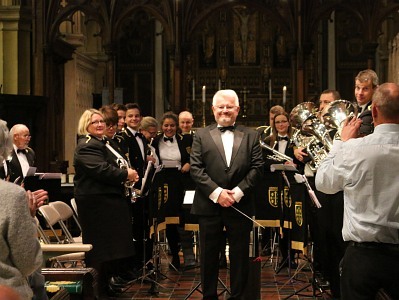 At 5:30pm there was a Songs of Praise to celebrate the 50th Anniversary of Abingdon Town Band, of which Steve Rich has been the musical director for the last 30 years. 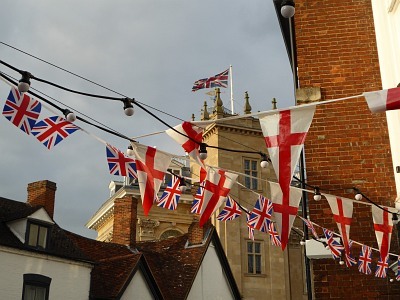 There was a mix of hymns accompanied by Abingdon Town Band, and Brass Band music. Short youtube of one Brass Band piece above.